You may need the PowerPoint Viewer to view this Presentation. 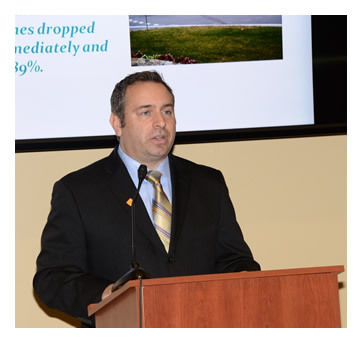 Roadway Safety Foundation Executive Director Greg Cohen opens the ceremony with welcome remarks. House Highways & Transit Subcommittee Chairman Sam Graves delivers remarks to attendees. 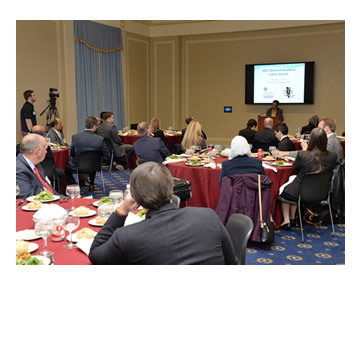 House Highways & Transit Subcommittee Ranking Member Eleanor Holmes Norton addresses the crowd. Highways & Transit Subcommittee Chairman Sam Graves (MO) congratulates MoDOT winner Bill Schnell & his wife. 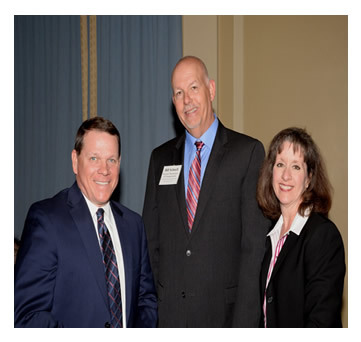 L-R: Greg Cohen, Roadway Safety Foundation Executive Director, Brandye L. Hendrickson, Federal Highway Administration Acting Administrator, House Highways & Transit Ranking Member Del. 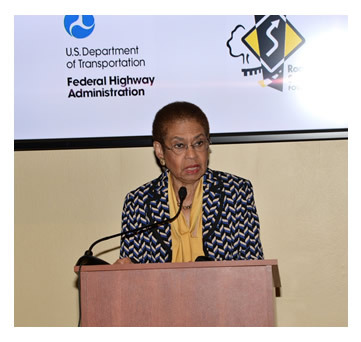 Eleanor Holmes Norton and House Highways & Transit Subcommittee Chairman Rep. Sam Graves. 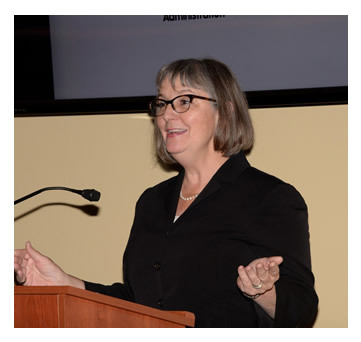 Federal Highway Administration's Associate Administrator for Safety Beth Alicandri speaks to attendees. 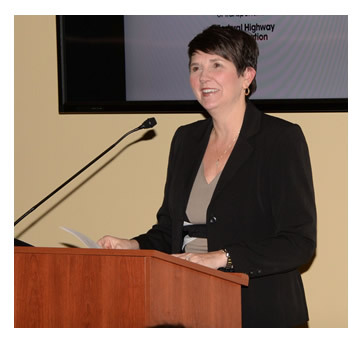 The Honorable Brandye L. Hendrickson, FHWA Acting Administrator, delivers the keynote address. 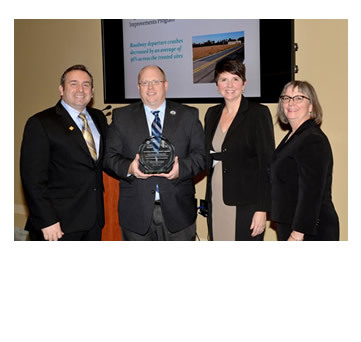 Greg Cohen, Brandye L. Hendrickson and Beth Alicandri pose with Adam Weiser after presenting an award to Delaware's Department of Transportation for its High-Friction Surface Treatment Systemic Safety Improvements Program. 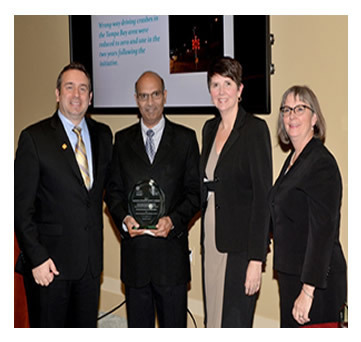 Greg Cohen, Brandye L. Hendrickson and Beth Alicandri pose with Dr. Raj Ponnaluri after presenting an award to Florida's Department of Transportation for its Wrong-Way Driving Mitigation Initiative. 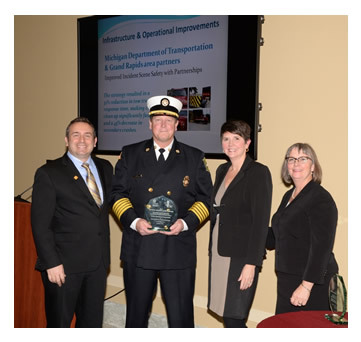 Greg Cohen, Brandye L. Hendrickson and Beth Alicandri pose with Fire Chief John Lehman after presenting an award to Michigan's Department of Transportation for its Improved Incident Scene Safety with Partnerships. 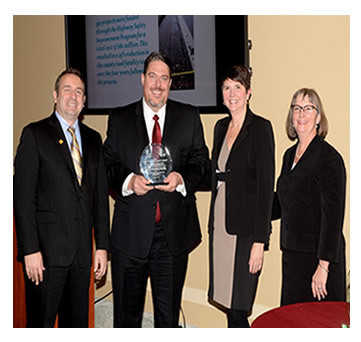 Greg Cohen, Brandye L. Hendrickson and Beth Alicandri pose with Wayne Sandberg after presenting an award to Minnesota's Department of Transportation for its Implementation of Data-Driven Safety Solutions. 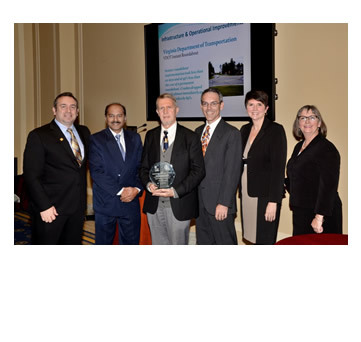 Greg Cohen, Brandye L. Hendrickson and Beth Alicandri pose with Sunil Taori, Ivan Horodyskyj & Randy Dittberner after presenting an award to Virginia's Department of Transportation for its Instant Roundabout. 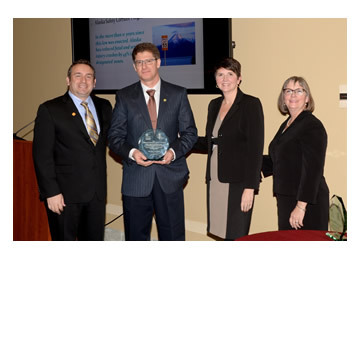 Greg Cohen, Brandye L. Hendrickson and Beth Alicandri pose with Scott Thomas after presenting an award to Alaska's Department of Transportation and Public Facilities for its Safety Corridor Program. 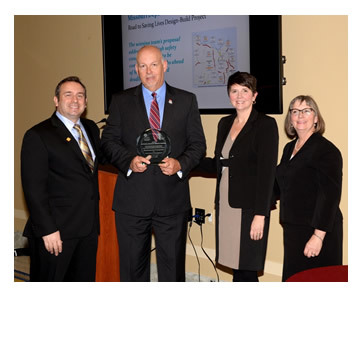 Greg Cohen, Brandye L. Hendrickson and Beth Alicandri pose with Bill Schnell after presenting an award to Missouri's Department of Transportation for its Road to Saving Lives Design-Build Project. 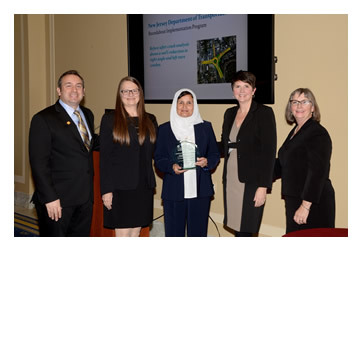 Greg Cohen, Brandye L. Hendrickson and Beth Alicandri pose with Caroline Trueman and Sophia Azam after presenting an award to New Jersey's Department of Transportation for its Roundabout Implementation Program. 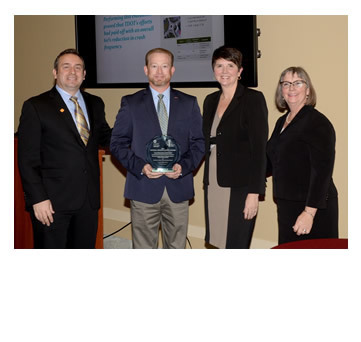 Greg Cohen, Brandye L. Hendrickson and Beth Alicandri pose with Brandon Darks after presenting an award to Tennessee's Department of Transportation for its Safety Projects Evaluation Report. 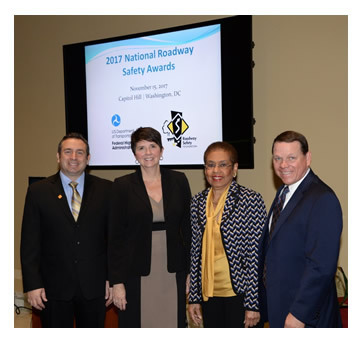 Greg Cohen, Brandye L. Hendrickson and Beth Alicandri pose with the 2017 Roadway Safety Award winners. 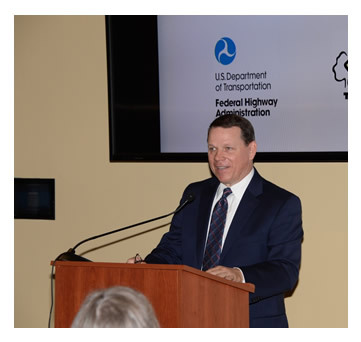 FHWA's Beth Alicandri & Brandye L. Hendrickson and RSF's Greg Cohen greet Del. 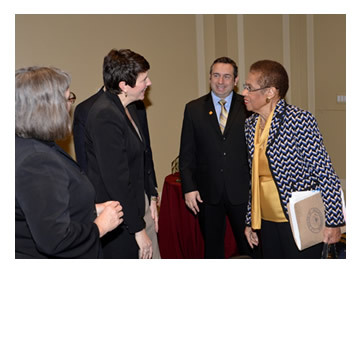 Eleanor Holmes Norton. 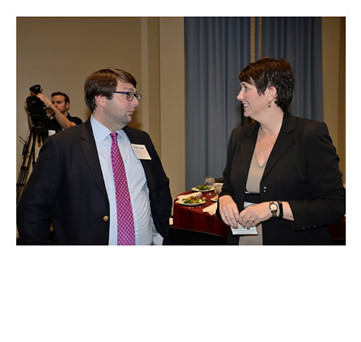 American Traffic Safety Services Association's Nate Smith chats with FHWA Acting Administrator Brandye L. Hendrickson. Ceremony attendees listen as Del. Eleanor Holmes Norton delivers her remarks. 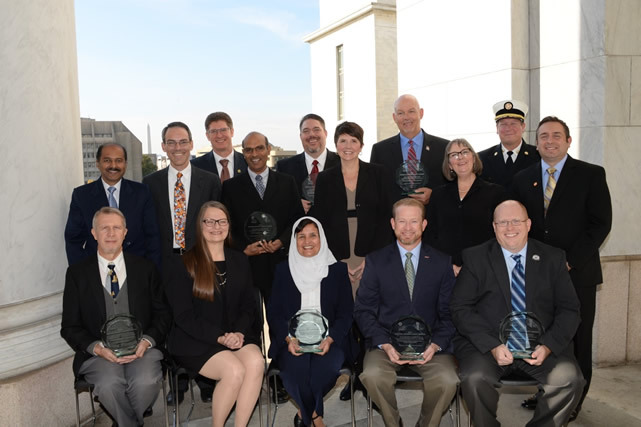 Congratulations to the 2017 National Roadway Safety Award winners! 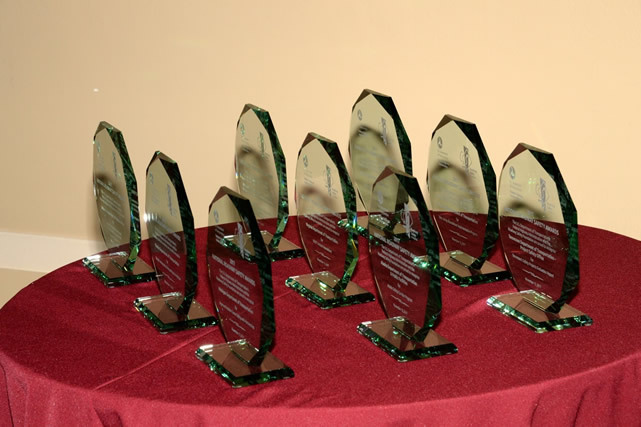 The trophy table displays the nine awards.